Mark and Craig McMorris siblings share stories and speak directly to new students in Kenyon Court. Mark McMorris, 20, grew up in the flat lands of Saskatchewan. He started snowboarding at age five in Lake Louise, Alta. After that first ride, he began to develop his skills further at home. Mark McMorris practiced on the vertically-challenged prairies using custom built ramps and rails on his family’s farm. In 2010, he won his first World Cup at Canada Olympic Park (COP) in Calgary. That win helped MArk McMorris realize he could have a future in snowboarding. The athlete went on to win numerous X Games competitions, developing a strong reputation in slope-style snowboarding for progressive tricks. He became the first person to land a triple cork snowboarding move in 2012, and he was the first Canadian to win a gold medal in the 2014 Sochi Olympics. From playing on the farm to Mark McMorris’ appearance on the Olympic podium, Craig McMorris has been Mark McMorris’ motivator, supporter and friend. 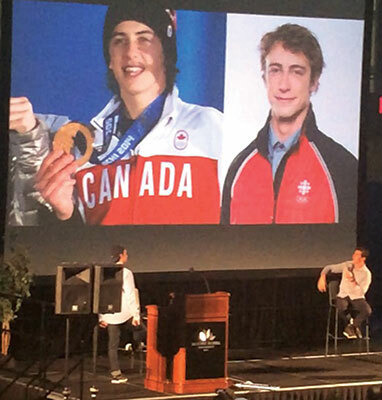 Mark McMorris described how Craig McMorris would help push him to the limit in the simplest ways. 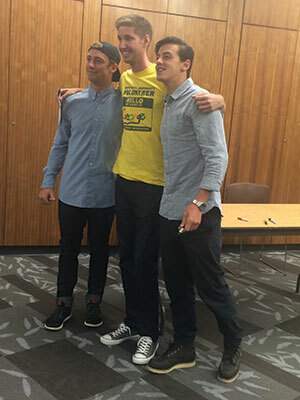 New Student Orientation leaders had the opportunity to meet the McMorris brothers. Craig McMorris asked the audience, “How can you use ‘you’ to make a mark?” He says that to make your mark in life you have to live in the moment. Eleven days before Mark McMorris was to compete in Sochi, he broke a rib in an X Games competition. For the next two weeks Mark McMorris did water aerobics and therapy. He recovered enough to compete and later win a medal at the Olympics. Mark McMorris got a ‘live for the moment’ tattoo at age 15 in New Zealand. Craig McMorris was a broadcaster at the 2014 Sochi Olympics. He covered his brother’s qualifying jump. Craig McMorris is also one of Canada’s top snowboarders. In 2013, he was on the Canadian National Snowboarding Team. Both brothers starred on MTV’s McMorris & McMorris. The show documented Mark’s ride to Sochi with his family and friends.